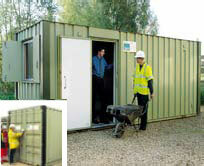 Designed to provide vandal resistant accommodation combined with a high standard of working environment. Units include offices, incorporating windows and a single door and fully lined steel stores. All are welded steel construction.